Your choice of cosmetic surgeon is probably the most important decisions you’ll make in terms of ensuring a successful and satisfying outcome. They will be able to advise you on which procedure is the best choice for you or even if they don’t feel that this is the most appropriate time to embark on such a life-changing decision. Trust and communication are key and before you even attend your cosmetic surgery consultation, it’s sensible to do as much research on your surgeon as possible. Mr Alan Park agrees that this is a lovely way to help patients feel at ease, so here’s a bit more information about his and his background. Mr Park attended the University of Glasgow in the late 1980s where he undertook his initial medical training. He continued training at the Universities of Edinburgh, Newcastle and Cambridge before completing specialist registrar training in plastic surgery in Birmingham. Following this, Mr Park undertook a Plastic Surgery Fellowship at the University of Toronto, Canada. 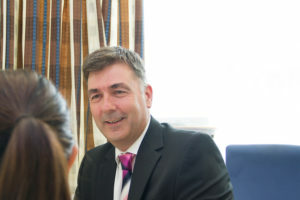 He was previously head of the Plastic Surgery department at the University Hospital Coventry and Warwickshire and works for a number of practices, working with both NHS and private patients. Mr Park has a great deal of experience under his belt, having practiced as a Consultant Plastic Surgeon for almost 20 years. Mr Park has a wide repertoire of expertise but his specialism is breast surgery, which ranges from augmentations, enlargements, reductions and reconstructive work following breast cancer surgery. He also specialises in paediatric (children’s) plastic surgery where he helps young people who are suffering with a variety of conditions including hypospadias, a congenital defect affecting young boys. Balancing his time between serving NHS and private patients means that Mr Park works across various practices. His primary NHS base is the University Hospitals Coventry and Warwickshire and he conducts outpatient clinics at Coventry and Nuneaton. While working privately Mr Park undertakes consultations at BMI the Meriden Hospital and the Nuffield Hospital. It’s easy to forget the surgeons are just normal people outside of their working lives and are likely to share similar interests to many of the patients they work with. Mr Park is married with a family and when not practicing in his clinics, he enjoys music and is fond of a round on the golf course. To arrange a consultation with Mr Alan Park, call us on 07468 418 419.